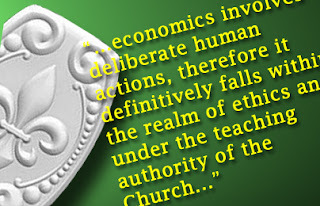 Although a wealth of principles and guidelines may be found in the social teaching of the magisterium of the Church, Catholic opinion concerning the realm of economic and social order remains murky and disparate, even among those of traditional mindset. This is grievously unfortunate. It is the work of Christianity to establish the reign of Christ on earth, thereby bringing as many souls as possible to salvation. While the perfect and eternal establishment of that kingdom awaits the return of Christ the King at the end of time, it begins with our toils here and now. Lest we labor in vain, it is essential that we possess a clear understanding of our purpose. The general foundation of Catholic culture appears obvious - the truths of Christianity must govern and inform every aspect of life. Religion cannot comprise merely one facet of your life, trotted out and observed on Sundays and special occasions. On the contrary, it must provide the underlying purpose for all of your actions, implicitly if not explicitly ordering them to their final End. Determining what that means in particular circumstances requires prodigious amounts of prudence. St. Thomas says that "in matters of prudence man stands in very great need of being taught by others, especially by old folk who have acquired a sane understanding of the ends in practical matters." Now, the principles of distributism were developed, advocated and explained by men renowned within the Church for their knowledge and understanding of the Faith and its traditions. For this reason, we should consider their writings with an open mind and a measured regard. First, let me dispel a few common myths. Distributists advocate the violent overthrow of the capitalist system. While distributists recognize many flaws in the capitalist system, any sane distributist also recognizes that Rome was not rebuilt in a day and that any radical changes would be both impractical and imprudent. Under Catholic just war theory, the latter considerations rule out violent overthrow as a moral option. Distributists want the government to seize all land and distribute it equally among the citizenship. The term distributism is somewhat misleading, particularly in this post-20th century world, which warily rejects any hint of the communism that so nearly destroyed it. Relax, distributism never advocates government seizure and allocation of property. In fact, in its proposed organization, capitalism resembles communism more than distributism does. The two former systems centralize the means of production in the hands of a few. In capitalism, the few wealthy; in communism, the few government officials. In Rerum Novarum, Pope Leo XIII pointed to the benefits of having productive property widely distributed among the citizenry of a society. When Hilaire Belloc coined the word distributism, he merely sought a succint means of expressing that model.Social teaching is not infallible. The Popes are not trained economists, therefore they cannot speak authoritatively on this matter. Furthermore, the social teachings of the Church are usually practical suggestions concerning a particular time period and its problems, therefore they quickly become obsolete and we need not study or observe any but the most recent. Perhaps ignorance of this magnitude is uncommon, but I have encountered serious Catholics who hold this notion, so I address it just in case. In the first place, economics involves deliberate (i.e. reasoned) human actions, therefore it definitively falls within the realm of ethics and under the teaching authority of the Church. It does not matter whether the Pope is a trained economist or not; in matters of faith and morals, he can and should speak, and we should listen. Secondly, although social teachings frequently address contemporary problems, they dictate universal principles rather than particular, practical suggestions. For example: "Every man has by nature the right to possess property as his own. "(Rerum Novarum, sec. 6) That is a general statement regarding human nature and human relations. Here is another one: "And on this very account - that man alone among the animal creation is endowed with reason - it must be within his right to possess things not merely for temporary and momentary use, as other living things do, but to have and to hold them in stable and permanent possession; he must have not only things that perish in the use, but those also which, though they have been reduced into use, continue for further use in after time. "(Rerum Novarum, sec. 6) Universal principles are eternal and unchanging, always relevant. The Church's teaching does not evolve; it grows in richness and clarity. Thus, we can learn as much from old social teaching as from new. In fact, it is questionable whether one can understand truly newer teachings without an understanding of the foundations they stand upon. Distributists are impractical, idealists. They romanticize the past and want to recreate the Middle Ages. During the Middle Ages, Christianity permeated society much more obviously and extensively than it has in the centuries following the Protestant Reformation and the Enlightenment. Therefore, distributists look to the Middle Ages, not to replicate a utopia, but to learn from a society which recognized the Christian hierarchy of goods.